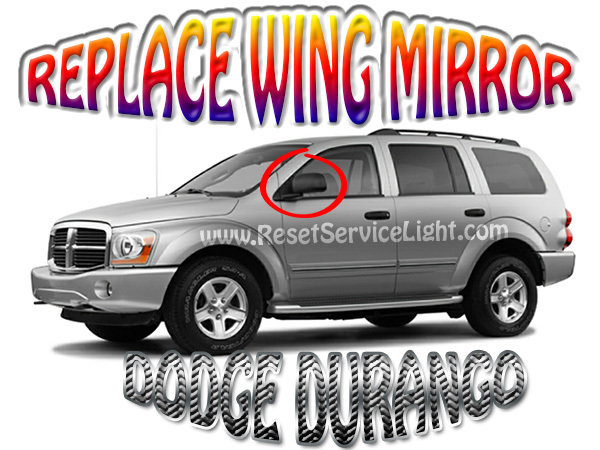 How to change the left rear mirror on a Dodge Durango 2005 you need a flat screwdriver, a Phillips screwdriver (star -shaped), a 10 mm socket wrench and to follow the next steps. You can begin the repair by removing the switch panel of the door, using the flat screwdriver. You have to pry out the panel carefully, by pressing near the door handle, as shown in the picture below. Push towards the front and it will come up. Then you will discover three harnesses that you have to disconnect by pushing hard with your thumb. 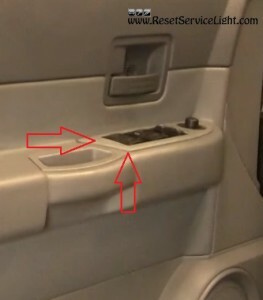 The next step of the repair consists in removing a small plastic cover, situated behind the door handle. You can do that by using the small flat screwdriver. It will uncover a Phillips screw, that you will have to remove. 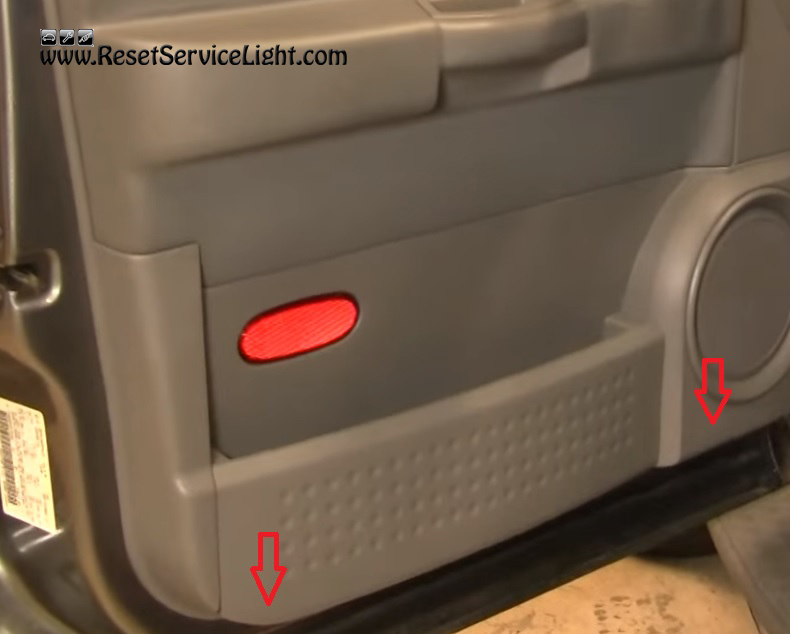 In order to take off the door plastic cover, you will have to unscrew the two Phillips screws situated on the bottom side of the door, as you see in the next image. Then you must push the panel up a little and pull it out, towards you. This plastic part will not come off though until you have disconnected the rod, the final connection that holds it. You can do that by pulling out the blue plastic clip, as shown below. 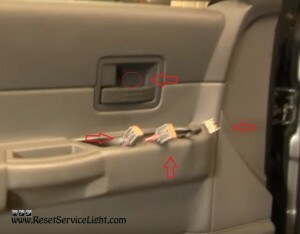 After you have detached the door panel, there is only one connector that you have to remove. You can easily do that by pressing the little tab, button, that secures the connection. At this stage, you can detach the mirror, but obviously, after you have removed the three 10 mm nuts that are holding it, by using the wrench. 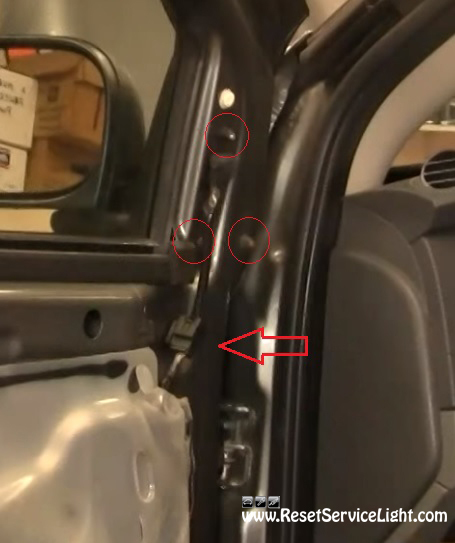 Be advised that you may have to close the door a little bit, as it can hit the A pillar of the car when you try to detach the broken mirror. You must keep that in mind also, when you will try to install the replacement. Do not over tight the nuts because you might break or damage your new mirror. Just tighten them firmly. 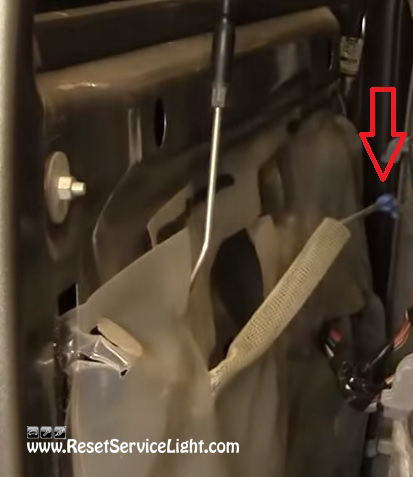 Make sure all the harnesses are connected properly, the rod is put back on and the front panel is aligned correctly. You must push the panel against the door (you can look behind it and see where your hooks must enter) and then slide it down. Everything should be nice and tight around the edges. This is all that you have to do to replace and reinstall the left side mirror on a Dodge Durango 2005.